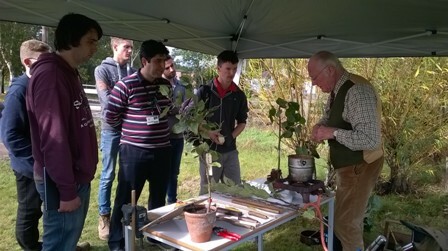 Much is made of the influx of migrant workers working in the 'edible' horticulture sector and questions asked why we cannot find sufficient 'home grown' workers........there are many opportunities in the UK horticulture sector for young people to embark on a rewarding career, but education IS the key factor! 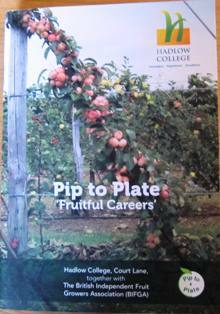 Many of today's growers - now in their 50's & 60's learnt their skills at Hadlow; with the lack of young people coming forward, Hadlow came under pressure in the 1990's and changed direction with amenity horticulture becoming THE career target for many new Hadlow entrants. 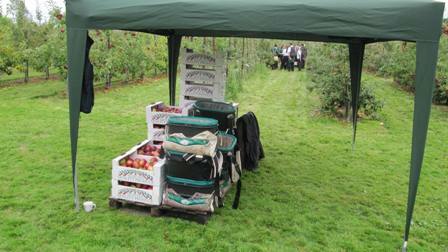 With an 'uplift' in the top fruit industry during the new millennium (after many years of decline) the need for a new initiative to attract young people into a college education with the prospect of fruit as their career target, was launched with the introduction of Pip to Plate....the event brings 14-16 year old children from schools in the surrounding villages to Hadlow with the intention of demonstrating the opportunities open to a college education leading to a rewarding career in the fruit industry. This year the Pip to Plate event opened with a welcome and introduction to the event and a short history of top fruit by Ryan Williams a former graduate and apprentice of Hadlow College now working for Avallon Produce Ltd.
New Technology: Robots are frequently proposed as the answer to many aspects of fruit production: 'harvesting' the most high profile.....but other robot capabilities are being developed to manage important management tasks. 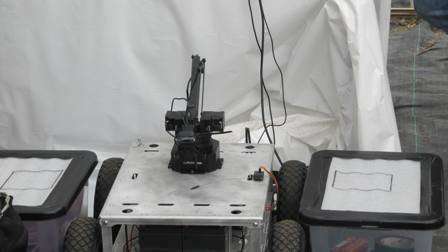 At Pip to Plate - Dr Jonathan Storey i3d robotics demonstrated a robotic system funded by an Innovate Uk grant. 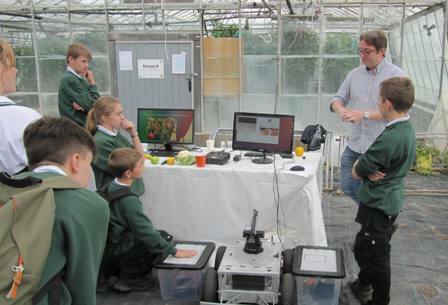 i3D robotics is working with Hadlow Agricultural College to monitor sweet peppers in one of their glasshouses. 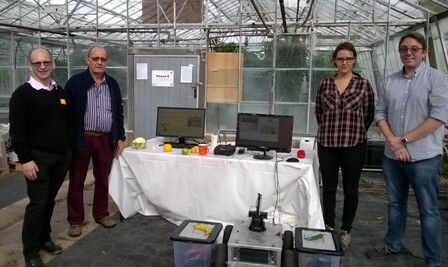 Two robotic systems are being developed: a fixed network of sensors to measure environmental conditions in the glasshouse (ambient light, temperature, pressure, relative humidity) and a mobile platform (rover) for autonomous crop inspection. 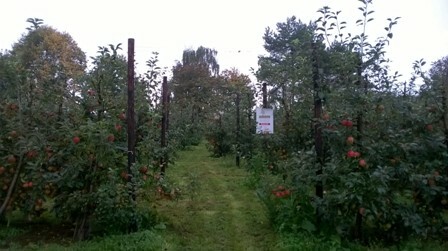 The mobile platform will be able to locate fruit in images, using state-of-the-art computer vision techniques, before performing spectral analysis on individual peppers. Sensors can generate a huge amount of data, so it is critical that only useful information is presented to users (who may not be familiar with the technology). 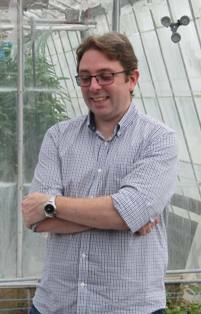 i3Dr is developing a suite of tools to process and visualise sensor data to provide growers with simple outputs, for example displaying a 'traffic light' for ripe/unripe, as well as more sophisticated options if required. The technology is readily transferrable to other crops and will enable growers to obtain insightful quantitative information such as yield estimates, detect issues such as heating or irrigation failures, or reliably determine the best time to harvest. 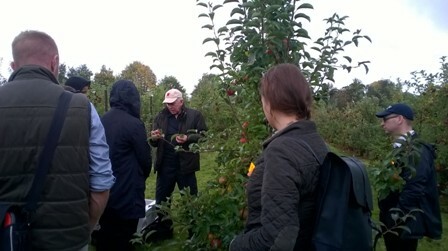 John Guest (The English Apple Man) and and Theresa Huxley (Sainsburys) with her colleagues Rob Stobart and Annabel Penela; promoted HE (Higher Education) with demonstrations of the specification requirements and how those requirements are assessed...Theresa explained the importance of delivering good red colour on bi-coloured varieties (Cox, Gala, Braeburn etc) and taste expectations measured by texture (firmness) and brix (sugars) - pupils were able to view brix levels on a refractometer. 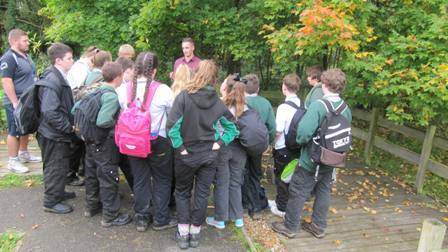 Rob Stobart explained the importance of good agricultural practices (GAP) and his responsibility for ensuring Sainsburys suppliers meet those expectations. Annabel Penela informed pupils about how she is responsible for auditing suppliers at home and in overseas supplier sources. 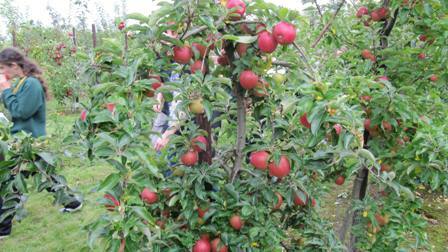 The English Apple Man told the pupils the opportunities in the fruit industry were very rewarding; financially and personally, but it is important to be prepared to start on the lower rungs of the ladder and gain experience while progressing to more responsible positions. Be it in technology, management, agricare etc. 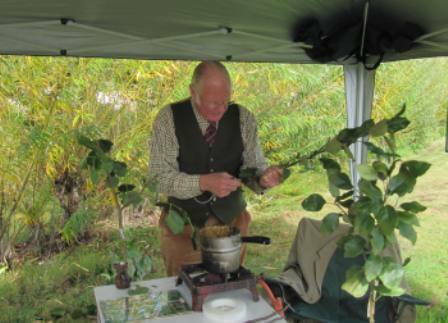 the opportunities are endless for this with a good education in horticultural practices (Hadlow College etc) and a strong work ethic.